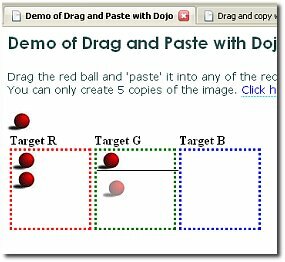 Recently I was asked how drag and paste can be implemented using Dojo. Means you start dragging an object and instead of dropping the object itself , you drop a copy of it. There can be quite a few ways of doing this. I'll discuss the lazy programmers way of doing it. No deriving your own class or going through the source code. One important thing for drag and drop in Dojo is your content needs to be enclosed in a container tag with distinct 'id'. This is referred to as source. So when we speak of creating another copy of original content, we need to ensure that we create a new id every time. In the above HTML snippet, <div id="placeholder"> acts as a placeholder for the source. It itself does not take part in drag and drop.The source only contains an image. A new copy of source is created inside this placeholder, after a drop(or paste) operation. There is a single source with id "w1" and three targets where it can be dragged and pasted(dropped). Similarly using different handler functions or counters it is possible to restricts number of copies in a particular target.